Slinger, WI – After an incredible 13-percent increase in attendance in 2017, an all-time-high, the Wisconsin Fishing Expo (WFE) continued the upward direction with yet another nine percent increase for the 2018 event, held February 23-25th. This is the third year in a row the WFE has seen significant growth in attendance numbers. In addition, the Expo, itself, grew by 17-percent, now featuring over 150,000 square feet of vendor space, including: manufacturers, retailers, boats, outfitters, electronics, lodges, accessories, and more. Bast-Durbin Advertising (BDA), current owners of the WFE, took the event over from the nonprofit, Madison Fishing Expo (MFE), in 2016 and like the MFE, itself, BDA continues to give back to the sport they are helping to promote. 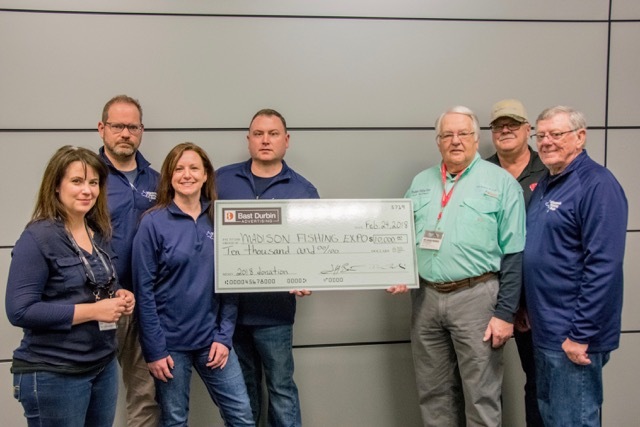 Not only does the WFE allow over 20 fishing clubs to exhibit at the Expo for free, but BDA, also donated $10,000 back to the MFE 501C3 so that they could distribute funds to fishing projects and clubs in Wisconsin. Groups like Fishing Has No Boundaries, Dane County Parks, The UW Fishing Team, Camp Anokjig, and other groups will all benefit. In 2018, the WFE also saw significant growth in new national manufacturer booths on display at the event, including: Daiwa, Shimano, Black Fish, Clam, St. Croix and others. The strong presence of manufacturers helped drive business to the seven-independent brick-and-mortar retail shops that were actively selling at the Expo. All of which equaled up to massive selection and great deals for consumers, as well as, huge sales for the vendors on hand. The WFE also added a new wing to the 150,000 square foot facility dedicated to fishing Kayaks and it was a huge hit. The 2019 expo is nearly full with many vendors looking to expand their presence at the 2019 Expo. Yearly, a waiting list develops, as more vendors learn of the success of the Expo. Bast Durbin Advertising is a full service agency that specializes in media-buying, public relations, social media and other advertising services aimed at the outdoor space.